In this episode, I show you the gear I use for my DSLR video shoots. Great video. I was browsing youtube for some good lighting instructional videos and yours was really helpful, especially the end where you turned each light off to see how it contributed to the look of the video. Hi, thanks for the vid. Could you please tell me what the name on the lcd viewfinder is, or a link? Great tips Tony! Keep up the great work! 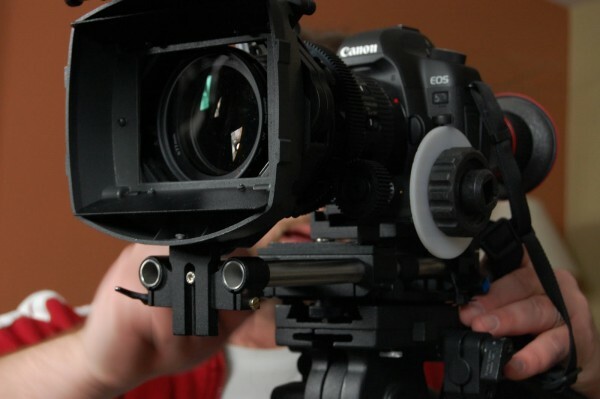 Where did you find the extra clamps nad plates for the D&S FM 18 and the riser for your slider? Where did you find the extra QR clamps and plates for the D&S FM 18 head and where did you get the riser for the slider? Where did you buy the mattebox? I am Vishwesh, i am photographer in profession, and also a short film maker. While i was looking for using dslr camera for video making, i came across your videos and was very excited about the equipment. But i was bit confused how will i be able to have such kind of equipment. When i browsed about your equipments in different websites, i was unable to choose the right one for me. I hold a Nikon D300 which does not have a video option in it, but i can hire a different camera which has video option available. But i have no idea how a nikon camera can give output of a video shot in it. As i have researched i found Cannon is giving a better output. Now i just want to know, if i am looking for the same equipment that you have and that you have showed in this video, how much will it cost and what are the things that i have to purchase and where. I need both shoulder held and the tripod held equipments. Please let me know about the above mentioned things. Looking forward for your help in this. I tried to watch the video but it says that the video is private. Can I get an invite please? Thanks for letting us know. Lately YouTube has been randomly setting some of our video to private. It doesn’t make me very happy. I’ve changed it to public and it should work for you know. Thanks for watching. Could you post the tutorial about the acer laptop being used as a moniter? Thanks and keep up the good work. how do you mount the tripod plate on to th cheese plate can you please do a tutorial? What kind of lens do you have mounted..? what follow focus system do you use? TONY!!! I know this is an old video but I hope you can respond. I was looking through your gear list and the only name I was unfamiliar with was CineCity matte box. I went to their site and was astonished by some the prices! Is this the same indian based company we are talking about? Are they legit?